(Berlin, July 25, 2018) Rail transport in Germany continues to grow. In the first half of 2018, patronage rose by 3.8% year on year in Deutsche Bahn's long distance segment, with a record 70.9 million passengers using the company's long distance trains from January through June. DB generated earnings before interest and taxes (EBIT) of EUR 974 million in H1 2018, a year-on-year decrease of EUR 205 million, or 17.4%. This decrease was due in particular to special charges resulting from inclement weather, a drop in rail freight transport volumes, and higher investment in punctuality. In 2018 alone, DB plans to increase investment by over EUR 100 million to raise its on-time rate. For 2018 as a whole, the DB Management Board expects full-year EBIT to be at the same level as EBIT in 2017 (adjusted figure for 2017: EUR 2.15 billion). 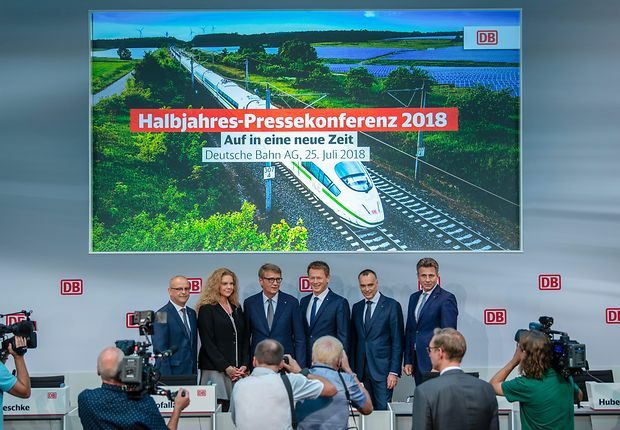 An electronic press kit (EPK), including footage from today's press conference and general DB photos, will be available on the DB media portal (https://mediaportal.deutschebahn.com). If you have any questions, please call +49 (0) 30 297-61030 (media packet) or +49 (0) 297-61194 (EPK).